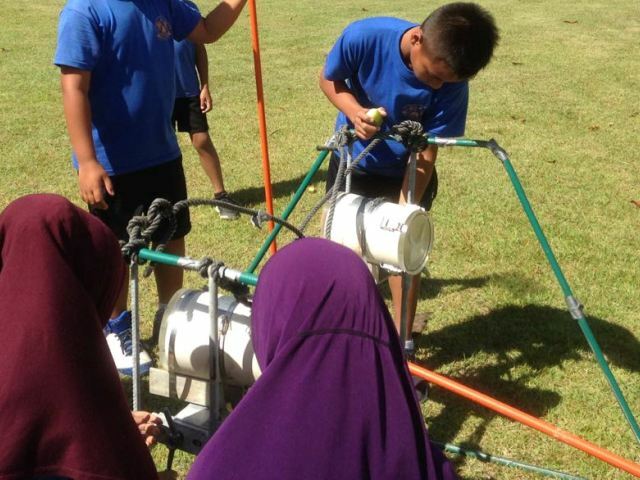 Cocos Island District High School students learn how to construct and deploy a BRUV. Image supplied. It’s STEM month at Teacher magazine and to coincide with National Science Week, we speak with Matthew Radburnd from Cocos Islands District High School. His students are taking advantage of their physical environment to conduct their own investigations and make Marine Science learning meaningful for all those involved. The students of Cocos Islands District High School are spoiled for choice when it comes to embarking on practical Marine Science lessons. Located in the Indian Ocean, southwest of Christmas Island and approximately midway between Australia and Sri Lanka, the tropical island is home to an abundance of marine life. The Year 7 to 10 students at the school are involved in a real world scientific project, building a Baited Remote Underwater Video apparatus (BRUV) and deploying it in the local lagoon to conduct fish and manta ray surveys. A BRUV is a system commonly used in marine biology research. By attracting fish into the field of view of a remotely controlled camera, the equipment records fish diversity, abundance and behaviour. The school has been drawing on the expertise of the Department of Fisheries WA’s Perth Office, who have been teaching students how to best use this equipment in their lessons. Maths and Science teacher, Matthew Radburnd says the students constructed the BRUV’s themselves, considering the design and how to avoid corrosion in the water. They used Go Pro cameras attached to a baited frame, which they lower to the bottom of the ocean. ‘They have to look at how it’s going to become stable on the bottom and then deploy them in the lagoon. What we hope happens is fish get attracted into the bait and we can capture and record what types of fish species have come by, behaviours and things like that, to add to research,’ Radburnd says. To allow for the application of real world learning, the students are also hoping to get some great images of manta rays and feed the information into a University of Queensland database on manta rays in the local area. ‘If we can feed them into that, we can hopefully see if those mantas have been spotted anywhere else; so, are they a local population or do they move from place to place? The students are not only gaining genuine experience with scientific sampling techniques, but also learning about the sensitive eco-system in their local area. The school was successful in applying for a National Science Week grant to fund this project, receiving up to $500 from the Australian Science Teachers Association. Radburnd says he hopes the program encourages students, many of whom speak English as an additional language, to continue collecting data and engage with the environment and marine animals around them. ‘Hopefully it’s something meaningful to the students and they can actually contribute to research,’ he says. How are you engaging students in STEM learning? How are you using the physical environment around your school to enhance your lessons? Good to learn new pedagogy and develop curiosity to learn new knowledge. This post seems to be very useful for Marine students, keep posting info like this. How to subscribe your blog? Need regular updates to my e mail? You can subscribe to Teacher bulletins and receive updates directly to your email. Simply click on the ‘Sign Up’ button in the top right hand corner of any of our web pages and enter your details. Thanks, Jo Earp [Editor].